16 February 2010, at 11:21a.m. 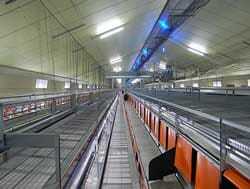 FRANCE - A new Big Dutchman aviary for 30,000 laying hens has been inaugurated by a farmer in the Nantes region. Emmanuel Merceron of Moutiers-sous-Chantemerle, located about 100 kilometres south-west of Nantes in France, has added a new income driver to his agricultural business. 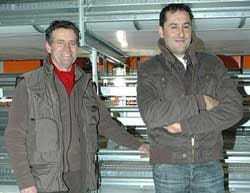 In addition to calf-fattening, together with his father-in-law Régis Ferret, whose farm Mr Merceron is running in the second generation, he now also produces free-range eggs. In the selection of the housing system for the 30,000 laying hens, the farmer has departed from previously trodden paths and decided in favour of the Big Dutchman NaturaNova Twin aviary. In a country in which alternative laying hen housing is dominated by one-level nest systems, this decision has naturally attracted great attention in farming circles. The impressive number of visitors who attended the open day, on the occasion of which the first Big Dutchman aviary on French ground was inaugurated, provided convincing evidence of this interest. There was a steady stream of visitors throughout the whole day and by the time the gates finally closed, an impressive 800 visitors had visited the location. The Frenchman had left nothing to chance in the planning of this project. After conducting initial exploratory talks at Space –– France's leading agricultural exhibition – in autumn 2008, Mr Merceron visited a number of large farms that produce eggs from free-range hens. In this context the technically interested farmer also travelled to Germany and to the Netherlands, where he visited leading European locations in the area of alternative ways of keeping laying hens. The result is that the complete housing equipment, from the aviaries via the pre-drying of manure to the packaging, comes from Big Dutchman. The company Matavicol of Le Theil de Bretagne (35), proved to be a competent partner for installation and electrical work and accompanied the project from the planning phase until final going into operation. Indeed, Matavicol continues to support Mr Merceron as a service partner taking over the after sales service. Moreover, Mr Merceron also ensured that the matter of marketing the eggs was clarified in good time. The eggs produced are supplied to his contractual partner, Norea, from whom he also acquires the laying hens as well as their feed. Norea is part of the Terrena Group, one of the largest businesses in the French agricultural trade. With NaturaNova Twin, Mr Merceron has the best equipment for keeping free-range hens: comfortable laying nests, perches arranged on several different levels, sufficient space to scratch as well as a free range of outdoor space during the day enable the hens to live according to their natural instincts. Furthermore, the system is structured in such a way that all areas of the aviary can be used at the same time. Orientated according to the natural requirements of laying hens, easily accessible supply units with feed and water are arranged in the aviary as well as raised, stress-reducing rest zones. A generous housing surface with wide outer runs are distinguishing features of the housing structure. Optimum stock densities in combination with a well-designed housing concept and sound system engineering ensure economic egg production. Furthermore, the system is arranged in such a way that Mr Merceron can always have easy access to his system and can control his stock of laying hens effectively, whilst only needing to invest minimal time in doing so.